For the longest of time, culture has been the measurement of a city’s existence. They know it, placing and displaying their cultural achievements in the forefront of their existence. The oldest running and highly anticipated international visual art event, the Venice Biennale has been in existence since 1895. It serves as an important platform for sharing, exposure, education and inspiration. Since then, cultural cities ranging from London [London Biennale] to Paris [Biennale de Paris] have followed suit to create their own platforms. Singapore who has long been labeled a “cultural desert” has come a long way culturally. A proven economic success, her cultural landscape has been engineered and nurtured. Learning everything from scratch, from theatre, drama, painting to film. Singapore pushes on with her artistic cultivation pursuit as it holds its very first Biennale. In recent times of war, terrorism and conflict, what is the basis of belief in this multi-cultural, cosmopolitan nation called Singapore? 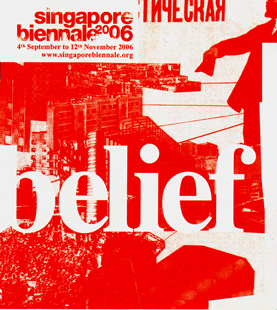 The Singapore Biennale revolves around this theme of belief as it features ninety five internationally and locally acclaimed artists from over forty countries. Showcased in fifteen locations dotted across the city, ranging from the expected museums to the unexpected public housing, the Singapore Biennale looks set to be a tantalising event. German artist Carsten Nicolai presents a visual and audio spectacle with his new media installation. Echoing geometric forms that viewers lie in, the installation bathes viewers in a spectrum of light, accompanied with music by the artist creating a surreal spatial experience. Japanese architect Shigeru Ban brings his unique “paper” architecture to Singapore. Stemming from a need for efficient and quick to build housing for disaster victims, Shigeru Ban has translated that materiality into his architecture. From a church to the likes of an office at the top of the Centre Pompidou in Paris, this “paper-tube”, architecture arrives in Singapore. Erected on the grounds of the Singapore Management University, it would be interesting to see the construction in the greenery of this city campus. From paintings, to installations. Photography to performance. Held in an array of spaces ranging from historical colonial architecture to religious buildings and onto post modern envelopes. It is a bizarre combination. It is a quirky fusion. Perhaps that is what Singapore is about. Undeterminable. A little bit of everything.